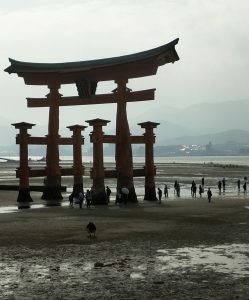 Silvio went to Okayama to visit his sensei Shigeomi Ogura. 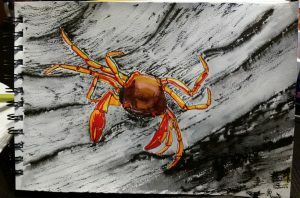 The tide was out when he visited Miyajima Island and he found lots of crabs and shells which inspired him during the evenings to do some drawings using Japanese ink pens and water pens. 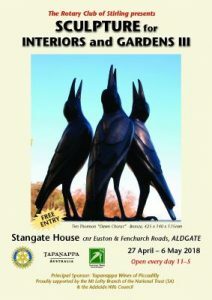 Silvio will be one of the many sculptors exhibiting at Stangate House, Aldgate, in support of Rotary projects. 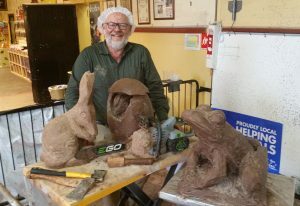 Here are the results of Silvio carving blocks of chocolate into animals on Good Friday from 10.00am – 4.00pm as part of Melba’s Easter Weekend activities which run until Monday 2nd April. There will be face-painting, breakfast from 9.30am and lunch options available. Melba’s Chocolates, 22 Henry Street, Woodside, SA ph: 8389 7868. 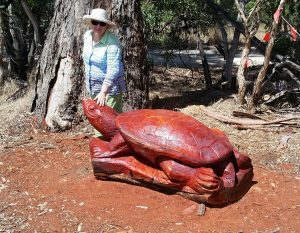 Silvio is working at the new Spring Lake Estate at Mount Barker, carving animals from red gum logs, mentoring indigenous artist Robert Wuldi who is carving a mother and child. 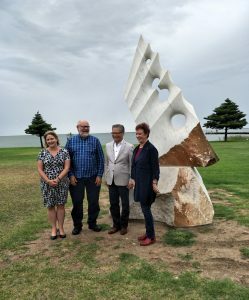 The official launch of Gheorghi Filin’s “Run Like The Wind” took place on the foreshore at Milang on the 10th February in the presence of His Excellency the Governor of South Australia, Hieu Van Le. Pictured are Federal MP Rebekha Sharkie, Silvio who was guest speaker in his rôle as Artistic Director of AHISS, the Governor and local community leader Katherine Murray who acted as MC. 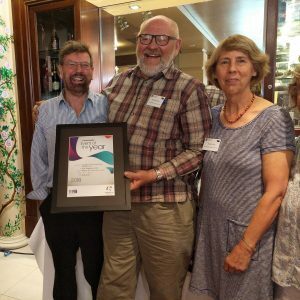 Silvio, along with founding members of the Adelaide Hills International Sculpture Symposium, Barry Windle & Nigel Steele Scott, were presented with Civic Awards by the Adelaide Hills Council. 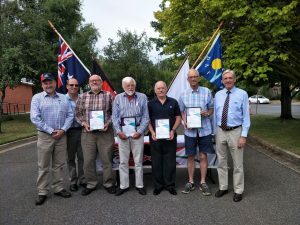 Pictured are councillors Andrew Stratford & Lynton Vonow, Silvio, Nigel Steele Scott, Treasurer of AHISS, David Furner also a recipient of a Civic Award, Barry Windle and retiring local member for Kavel, Mark Goldsworthy. To top the day off, the 2017 “Sculptors @ Crystal Lake” at Macclesfield, which was inaugurated by Silvio in 2015, won “Event of the Year” in the District Council of Mt Barker’s Australia Day honours. Silvio is pictured with tireless committee members Dave & Anne Welsh. 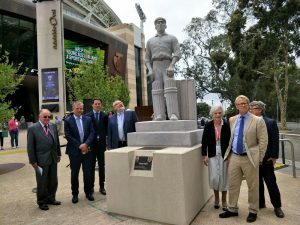 Silvio’s sculpture of former Australian captain, SA cricketer Clem Hill 1877-1945, was unveiled at Adelaide Oval yesterday with several members of the Hill clan attending. Clem was a brilliant batsman who retired from the game in 1912 as the world’s leading run scorer. The sculpture was funded by benefactor Basil Sellars AM and completes the 8 commissioned works at the Oval. 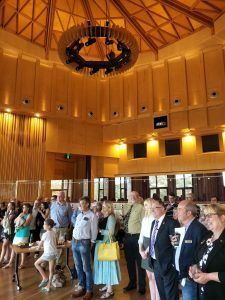 The official launch of the Hills Sculpture Trail took place at Ukaria Cultural Centre, Mount Barker, a superb venue to celebrate the extraordinary vision of Silvio and his supporters in the Hills and Fleurieu communities. The 25 visiting sculptors excelled themselves and the trail will be a great addition to culture & tourism in the region. 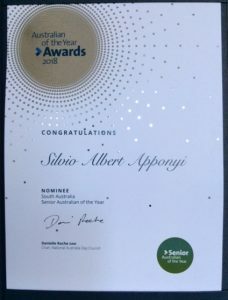 Silvio was shortlisted as 2018 South Australian Senior Citizen of the Year, one of 4 finalists. What an honour! He was nominated for his lifetime contribution to the arts, mentoring of young artists and promoting reconciliation with indigenous people. The winners in each category will be announced on Monday night 30th.